England captain Andrew Strauss departs after having his stumps knocked over by Morne Morkel. (CNN) -- England reached 103 for just the loss of captain Andrew Strauss in reply to South Africa's 343 on the second day of the second cricket Test in Durban, which was again shortened due to bad light. Strauss got England off to a flying start with 54 off 67 balls as he dominated an opening stand of 71 with Alistair Cook. 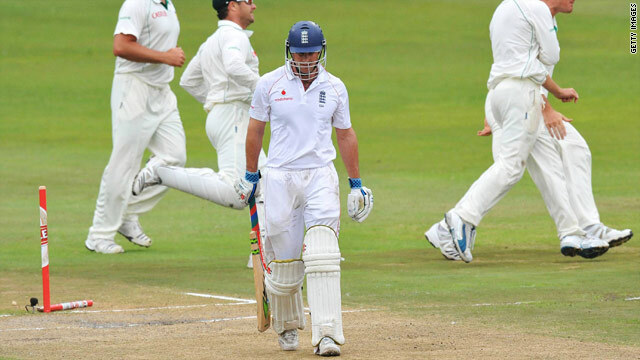 Cook was unbeaten on 31 along with South Africa-born Jonathan Trott (17) when play was ended with 22 overs still scheduled to be bowled. The hosts had resumed on Sunday on 175-5 as play started half an hour to make up lost time, but needed a last-wicket stand of 58 between Dale Steyn and Makhaya Ntini to pass the 300 mark. Overnight pair AB De Villiers and Mark Boucher took their nascent partnership to 63 before the latter was trapped leg before wicket by spinner Graeme Swann for 39 as England successfully took umpire Amiesh Saheba's initial "not out" decision to the video official. Strauss immediately took the second new ball, with seamer Chris Broad having De Villiers caught edging to wicketkeeper Matt Prior for 50 after the right-hander had survived a lbw referral call off James Anderson four runs earlier. Swann was brought back into the attack after only nine overs, and dismissed Paul Harris lbw for two despite another video referral. The off-spinner then removed Morne Morkel lbw for 23 to claim his fourth wicket and leave South Africa on 285-9, but he was then smashed out of the attack by Steyn. The No. 10 batsman clubbed three fours and three sixes as he made 47 off 58 deliveries before Anderson ended the South African innings, with last man Ntini unbeaten on six. Strauss then blasted nine boundaries as he took toll on the home bowlers, but was bowled by Morkel soon after having an lbw decision for the same bowler overturned on referral. Cook and Trott steadied the ship as England, who escaped with a draw in the first Test, seek to establish a winning position. "It does seems a bit of a struggle when the clouds are coming in at four o'clock every day," Swann said. "Hopefully there'll be another day like the first, if the sun comes out tomorrow. "It would be a shame if this game ended up being a victim of the weather. It's nicely poised at the minute. We've lost quite bit of play already and we don't want to lose any more."